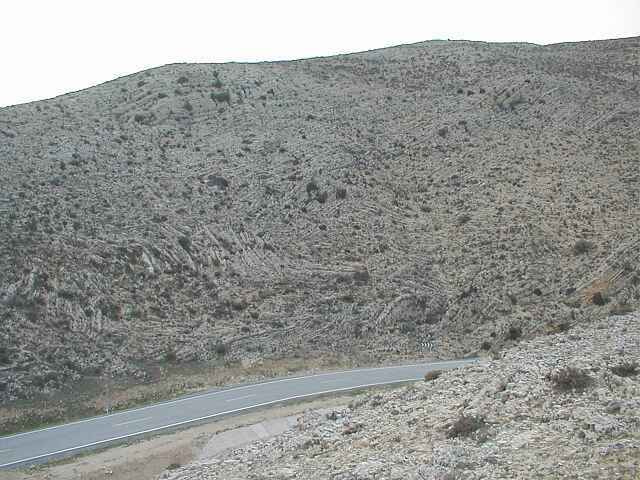 Megabrecciation of Jurassic limestones in the southern central uplift near Bueña. Note the chaotic criss-cross layering (A) and some “ghost” layering having survived the intense brecciation (B). Interpretation: A distinct megabrecciation is a typical structural feature in the central uplift of complex impact structures and well known from many craters.The giant compression occurs in the modification stage of impact cratering, when the transient cavity collapses and large rock volumes undergo a centripetal accelleration towards the center of the structure.In the Rubielos de la Cérida impact structure, the enormous compressive signature with strong deformations up to continuous megabrecciation is evident nearly everywhere and can best be observed in cuts from road constructions.